100% Pure Essential Oil. Pure Aromatherapy. Single Origin . USDA Organic. Cymbopogon Citratus. 100% Pure Essential Oil. Country of Origin: Guatemala. Extraction name: Steam distillation. These 100% natural essential oils are meticulously extracted from plants by cold pressing or steam distillation using the same techniques developed by the medieval Persian physician Avicenna. Supplement Facts: 100% pure natural essential oil. 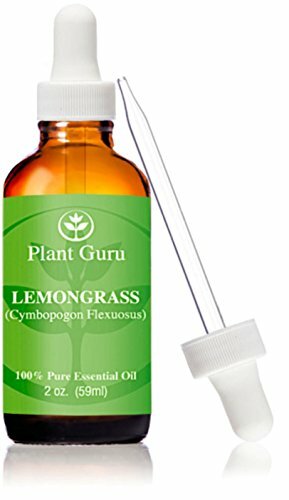 100% pure lemongrass essential oil All Nature's Alchemy high-quality botanical oils are scientifically tested for purity and contain no chemical solvents added alcohol or other extenders. Directions: Perfect for aromatherapy baths room fragrancing personal fragrance potpourri massage oil fragrancing or anywhere you would like to have a wonderful fragrance. Warning: Concentrated. Not for internal use. Keep out of reach of children. Warning: Concentrated. Not for internal use. Keep out of reach of children. 100% Pure Essential Oil. Cymbopogon Citratus. Use this Lemongrass (Cymbopogan Flexuosus) Essential Oil during massages to decrease muscle and joint pain. It can also be used to improve skin, repel bugs, improve energy levels and uplift your spirit. With a satisfying scent, this essential oil is just what you need. Great quality at a great price, these essential oils are incredibly concentrated and powerful to help you in multiple ways. Because of their strong concentration, ensure safe use by properly diluting with a carrier oil. Always test for skin sensitivity prior to widespread use. Keep out of eyes, ears, or nose. Keep oils tightly closed and out of the reach of children. Do not ingest essential oils unless guided by a trained professional. The information provided on this website is only our opinion and is not intended as medical advice or diagnosis. Statements have not been evaluated by the FDA and are not intended to diagnose, cure, treat or prevent any disease. Information on this page should not be interpreted as medical advice, meant for diagnosing illness or for prescriptive purposes. Always discuss any essential oil use with your doctor or trained aromatherapist. Features: States: Iowa Country of Origin: India Botanical Name: Cymbopogan Flexuosus Extraction Method: Steam Distilled Aromatic Scent: Crisp lemony aroma with herbal woody undertones Top Uses: Great during massages, has been used to decrease muscle and joint pain, can improve skin, natural bug repellent, diffuse to improve energy levels and uplift spirit Caution: Maximum dilution of 0.7-percent is best to avoid skin irritation. Not advised for children under age 2 or those with pre-existing skin issues 100-percent pure, therapeutic quality Material: Oils About the Manufacturer: Welcome to Destination Oils. My name is Kara, and I am the owner of Destination Oils, a small essential oil business located in Iowa. We want to bring great, high quality essential oils and unique aromatherapy jewelry to the online marketplace. Our oils are 100-percent pure, therapeutic grade with no fillers, preservatives, or chemicals. Just oil. The best quality for a great price. Create a stimulating ambiance with this lemongrass essential oil from Now Foods. Featuring a bold, lemony fragrance, this aromatherapy oil is steam-distilled from the plant's leaves to increase potency and purity. Size: One (1) ounce Aroma: Strong, lemon-like Active ingredients: 100-percent pure lemongrass oil, Cymbopogon Citratus We cannot accept returns on this product.